All-New Stamping specializes in custom precision metal stampings for complex, high precision parts for the aerospace, chemical, automotive, electronics, marine and musical instrument industries. We manufacture parts ranging from small precision parts for electronic equipment and musical instruments to complex components for processing equipment to large architectural components that are decorative and functional. 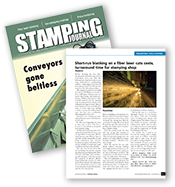 At All-New Stamping, our customers come first. Our core values of listening to you and delivering a high-quality product the first time, every time brings added value to every part we produce. That’s what Power Satisfaction is all about. The 40,000 sq. ft. state-of-the-art production facility at All-New Stamping offers the capacity for quantities as low as 25 and up to 1,000,000. With over 60 years in the business, we are perfectly positioned to work with you to maximize your production dollar.